Angus, this is a dog subscription box! This review is of the Large Dog, $35.95 a month, box. This particular design wasn’t in the Fight4Them shop, so I’ve assigned it the value of the other short-sleeved t-shirts they offer. It’s a wonderful sentiment and definitely in line with the Fight4Them message although it would make me feel a little hypocritical to wear since I got Nyx from a breeder. (All my cats are rescues, though.) Still, it fits and it seems to be nice material and I can at least wear it around the house. Spunky Pup Alien Flex Hammer (L) – Value $9.99? Interactive Dog Toys Super Tough Hydrant (L) – Value $11.99? Pawsitively Gourmet Doggie Pastry – Value $3? This was cute. Since the first ingredient is wheat, Nyx can’t have it due to her IBD. I will pass it along to a coworker’s dog to enjoy. This is a wholesale supplier so the value is an estimate. Pawsitively Gourmet is located in Colorado and uses ingredients grown and manufactured in the U.S. Here are some shots of Nyx enjoying the toys. Verdict: I calculated an estimated value of almost $58 for the February Blockhead Box. That is quite good. I like how the doggie items were suitable for heavy chewers and otherwise destructive dogs. Due to Nyx’s dietary issues, I was pleased that the majority of the value this month was for non-food items, but I also realize that might not always be the case. 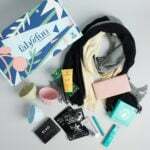 What do you think of the February Blockhead Box? Do you subscribe to any dog or cat boxes? Angus reminds me of my Bam Bam who is so stinkin nosey. He has to be in every box I get and smell it all. I am screaming about how cute Nyx looks in that first picture. I think Angus likes any box. Nyx is a darling but I love seeing Angus peeking in the box also.